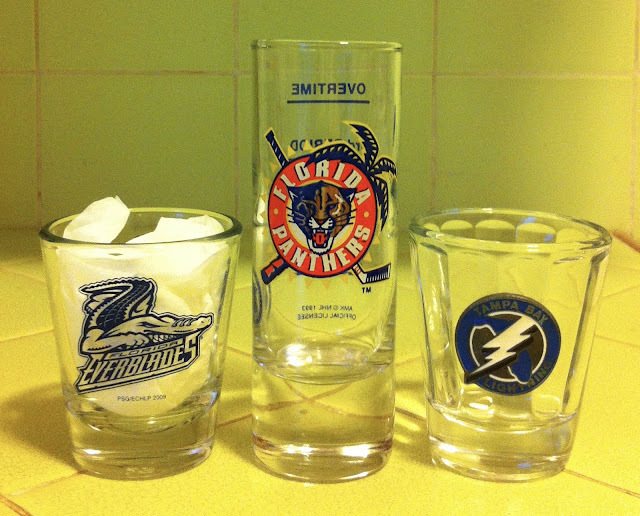 In March of 2014, the Tampa Bay Lightning traded St. Louis to the New York Rangers, which threw a wrench into our plans. 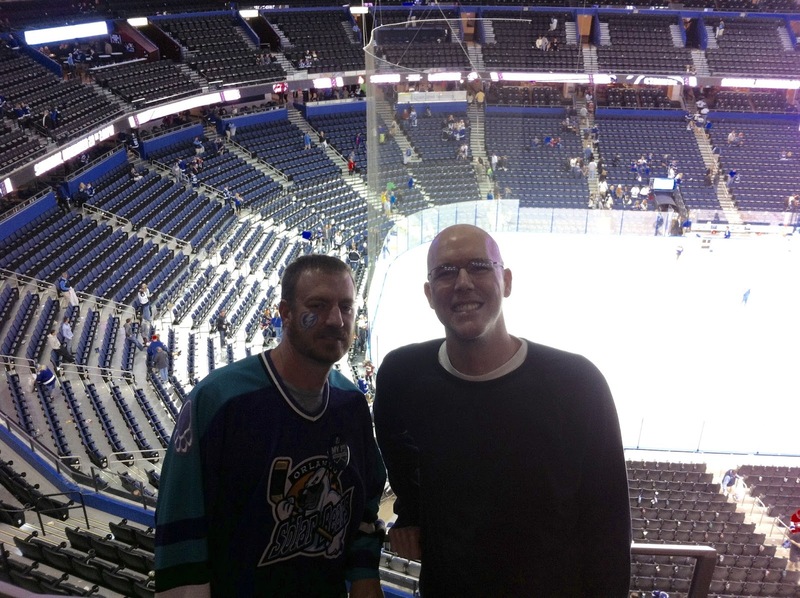 We still had every intention of going to Florida, but it felt like a small part was missing (no pun intended), and so we carried on in spite of the apparent absence of the diminutive forward. We would visit the entire state during the week of Thanksgiving, as Chad had some family in the Tampa area who offered to host us for a holiday dinner. Luckily for us, the scheduling gods were also smiling upon us. The Florida Gators football team had a home game on the Saturday before Thanksgiving, and the Florida Panthers and Tampa Bay Lightning would also be home that week as well. Better yet - the Lightning would be hosting that same NY Rangers team, and this would be the first game that St. Louis would be playing against his former mates - it was too perfect! 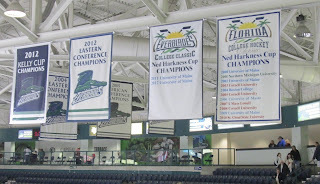 After originally planning to only see the two NHL games, I noticed that the ECHL's Florida Everblades would also be in town during our visit, so we decided to fly into Fort Myers. We arrived late in the afternoon, picked up our rental car, and drove straight to Germain Arena in Estero. 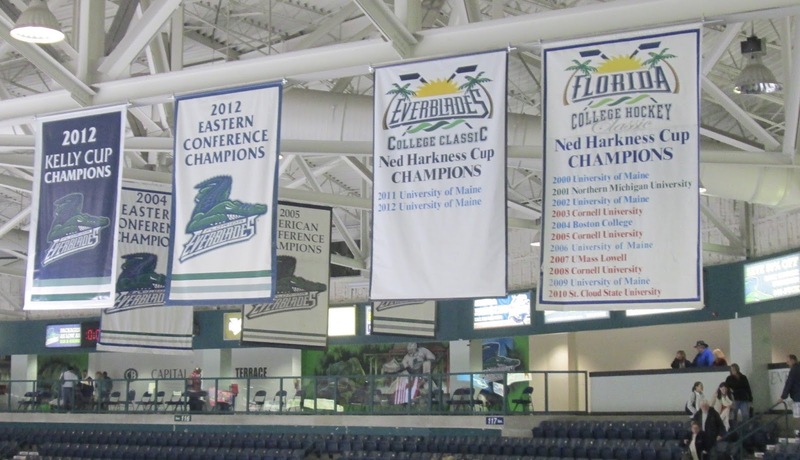 Owned by Carolina Hurricanes chairman Peter Karmanos, the Everblades have been quite successful during their nearly 20-year existence, making three trips to the Kelly Cup Final, and taking home the ECHL title in 2012. As an added bonus for us, this Friday night contest would feature a birthday party for team's mascot, Swampee. The ECHL has a real family-friendly vibe, and while the quality of hockey may be a step down, it's still enjoyable and this game was no different. There's a real community feel, as it seems like many of the fans in attendance seem to know each other, plus you can always count on inexpensive concessions. We were still somewhat exhausted from our flight - especially since we had a layover in Houston - so we sank down into our seats and relaxed for the next few hours. All in all, it was a fun Friday night - and we even got to meet the birthday boy! Since the Florida Gators game was set to begin at Noon on Saturday, we decided to make the four-hour drive to Gainesville immediately after the Everblades game, where we found a Motel 6 and crashed for the night. 8am came awful early that day, but we had to get up and get over to campus so we could find a place to park before it got too crowded - as I learned during my previous visit to an SEC campus on football game day, the entire area will be swarmed by fans and students, all ready to tailgate as soon as possible. The University of Florida campus is beautiful but sprawling, so we spent the hours prior to kickoff wandering around and taking in the sights. It's hard to pinpoint the exact time in which I became a fan of the University of Florida's football team, but I'm sure it coincided with the arrival of coach Steve Spurrier - I gravitated toward his uptempo style of play and always found it entertaining. My favorite player of that era was quarterback Danny Wuerffel, who won the Heisman Trophy in 1996, the year in which the Gators captured the National Championship. Ten years later, I couldn't help but be fascinated by Tim Tebow, who also won the Heisman Trophy during a highly-decorated career in which he and his Gator teammates won two NCAA championships. When it came time for me to finally buy a jersey, there was only one choice (also, it's VERY hard to find a Wuerffel jersey). Unfortunately, it was a rather gloomy Saturday with rain showers throughout the day, and when combined with the lackluster opponent (Eastern Kentucky) it made for a somewhat tepid crowd. It may not have been exactly the experience I was hoping for, but I still enjoyed myself thoroughly. I sang the school fight song, did the "Gator Chomp", and soaked in the spectacle. As expected, the game wasn't very competitive (Florida won 52-3), so we made one last trip around the stadium then ventured out into Gainesville in search of food - this led us to Big Lou's NY Style Pizzeria, which was a perfect spot for our late lunch. With our bellies full, we dodged the raindrops while walking through campus, before ultimately heading out of town to make the two-hour drive to Orlando. Chad had booked us a hotel near Universal Studios, so we spent the evening exploring the CityWalk area. Another day, another early wake-up call: we had one day to spend in Orlando, so we wanted to get to the Universal Studios theme park as soon as possible. We arrived just before the gates opened and waited patiently: what followed was a full day of exuberance and unmitigated joy as we traversed the massive park, experiencing nearly every ride with a child-like glee. The Wizarding World of Harry Potter was the main attraction, and we even got to ride the Hogwarts Express since we had a Park-to-Park ticket for both Universal Studios AND Islands of Adventure. As an added bonus, I got to meet my favorite member of the Simpsons family! Words can't begin to describe how sore my entire body was by the time we collapsed back at the hotel - but it was worth every second! It was a fun weekend, and now it was time to finally see some NHL hockey - but we had to make another lengthy drive to do so, traveling more than three hours south to the city of Sunrise. We arrived in the early afternoon and went straight to Sawgrass Mills, the largest outlet mall in the United States - which also happens to be located right next to the BB&T Center, home of the Florida Panthers. I'm sure we covered about as much ground in that mall as possible, but likely still didn't see it all. We grabbed a late lunch, then walked across the street to experience the pre-game festivities outside of the arena. I don't like to speak ill of these markets when I go on my hockey road trips, but this may have been my least memorable NHL experience: the tickets were cheap, the seats were mostly empty, the mascot was nowhere to be found, and the crowd was quite dull and lifeless. We spent the majority of the game walking around the concourse, sitting in a different section during each period, and perusing the team's history on display. Honestly, the less said about this game the better. The Wild jumped out to a 2-goal lead in the first period and never looked back, cruising to an easy victory. I remember very little of the actual gameplay, and we didn't waste much time hanging around after the game. I would definitely love to come back and visit again to see how much has changed as the team (hopefully) improves, but this evening left a lot to be desired. Here's to brighter days ahead for this franchise and their long-suffering fanbase! But this was South Florida, which meant that 10pm was still early - we quickly drove down to Miami to see as much of South Beach as we could. Little did we realize that the night was just beginning, and we spent about an hour walking up and down the beach before grabbing a late-night dinner at a local hotel restaurant. This was our "travel day": a nearly five-hour journey from Miami to the Gulf Coast town of New Port Richey, where Chad's aunt had left her house open for us to stay while she was out of town. 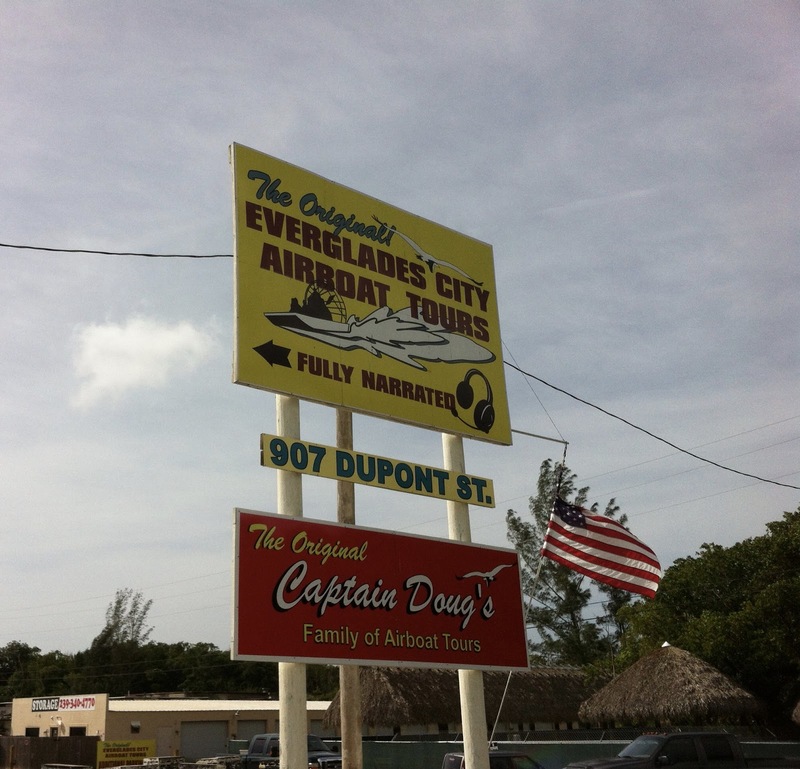 But I did make sure that we made one particular stop along the way - Chad made a reservation for us with the Everglades City Airboat Tours! I've always wanted to take one of these tours, and it did not disappoint: it was like a theme park ride mixed with a museum visit, and it was a blast! We even had some visitors along the way! From there, we headed north to the Tampa area, unfortunately driving directly into the path of a MASSIVE thunderstorm. After more than four hours in the car, we arrived in one piece at our home for the next few days, and Chad's cousin was nice enough to take us out for dinner that night. We definitely appreciated the time to relax as we prepared for the most memorable day of the trip. New Port Richey has no shortage of cozy eateries, so we grabbed a quick breakfast at Jimmy's Neighborhood Restaurant and then made our way toward Tampa. When I began researching this trip and looking up tourist attractions, one of the first that came up was the Salvador Dali Museum: situated across the bay in St. Petersburg, this wound up being a terrific way to pass the time before the hockey game. I'd always heard about Dali over the years - mostly due to his collaborations with both my favorite filmmaker (Alfred Hitchcock) and photographer (Philippe Halsman) - but I knew very little about the artist and his work. Spending the afternoon at an institution devoted to his career was eye-opening to say the least, and provided a lot of insight into one of the most creative minds of our time. As an added bonus, there was a special exhibit dedicated to Dali's relationship with fellow Spanish painter Pablo Picasso, yet another recognizable artist of which I knew very little. While walking through the museum, I couldn't help but be struck by inspiration from all sides, witnessing the talent and ingenuity on display. If you're going to be in the Tampa area, you HAVE to come here! But now it was time to venture back onto I-275 and head to Tampa, where we stopped for dinner at Precinct Pizza. Considering the vast amount of New Yorkers now living in this part of Florida, the proprietors of this restaurant were smart to place their business - a NY style pizza joint - within a mere stone's throw from Amalie Arena. The food was great, the atmosphere was charming, and it made for an ideal pre-game experience. Just as I had hoped, this game was fantastic: the mood was electric (no pun intended) right from the opening puck drop, as the numerous Rangers fans in the crowd were just as animated and engaged as the home fans. Steven Stamkos would open the scoring before the game was even five minutes old, then during the first break in the action the home arena focused its attention on their recently-departed star. During his thirteen seasons in Tampa, Martin St. Louis established himself as the franchise's greatest scorer, appearing in six All-Star games, winning two NHL scoring titles and a Hart Trophy as league MVP. The salute to St. Louis was uplifting and honorable, giving the fans a wonderful opportunity to show their recognition to one of the team's most beloved warriors. Soon after the tribute, the Rangers would respond with two goals to take the lead halfway through the first, before Ryan Callahan scored the tying goal as the exciting period came to a close. Callahan would break the tie in the second period, and the teams traded goals in the third, before the Lightning held off a late flurry from their opponents to escape with a hard-fought 4-3 victory. 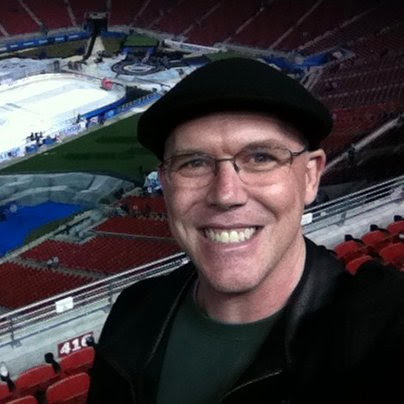 It was a great time at a beautiful arena - one of the best experiences I've ever had at an NHL game. We made a quick stop for some frozen yogurt before returning to New Port Richey, exhausted from a full day. It was a much-needed day of rest, as we prepared to close out the lengthy trip. I wanted to make the most of our last day in Florida, so we started with a hearty meal at The Breakfast Station in New Port Richey, and then I convinced Chad to witness one of my favorite sports in person: women's college volleyball. I discovered it a few years back, and enjoyed the speed of the game as well as the athleticism on display. Plus, I love visiting college campuses and this was a great way to relax while everyone was out shopping. Arriving at the University of South Florida in the early afternoon, we decided to take a leisurely drive around campus since it was a little chilly and we weren't up to walking. Due to the holiday, there were hardly any students roaming around and both the college bookstore and student union were closed for the day. We made it to the gymnasium and settled in for a rousing 5-set match that saw the home team defeat the University of Cincinnati, closing out their season schedule on Senior Day. After the game, we made our way back across the bay to the coastal city of Clearwater to find something to eat. But why did Chad pick this particular location? He's a huge wrestling fan, and Clearwater was the home of Hogan's Beach, a sports bar loaded with memorabilia and the likeness of Hulk Hogan. It was kitschy but fun, and the food was actually pretty good. Sadly for all of the Hulkamaniacs out there, the restaurant would close its doors the following year, but it did make for a fun diversion, and a perfect way to end our trip. We returned to Los Angeles the following morning, but not without making a lifetime of memories. I knew this was coming from the moment I got my passport: my first trip to Canada!